Are You Brave Enough to Dine on an Open Platform Suspended 150 Feet Above Manila Bay? Music Management International (MMI), the concert and events promotions organization, is diversifying its portfolio of entertainment offerings with an entirely new concept. The company has partnered with a Europe-based company to introduce Dinner in the Sky (DITS) for the first time in the Philippines. A culinary adventure with roots in Belgium, DITS is exactly as it sounds. 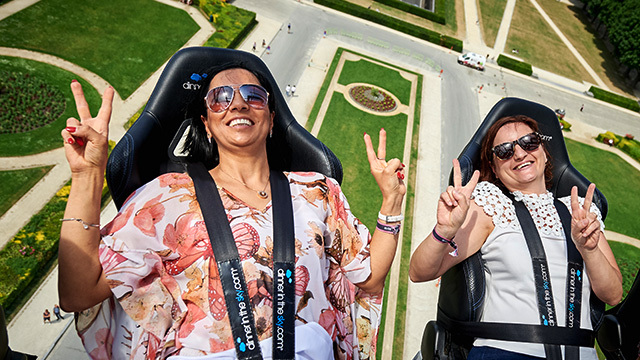 Diners are strapped into a chair and hoisted 150 feet up in the air where they can enjoy a lavish feast and amazing views. 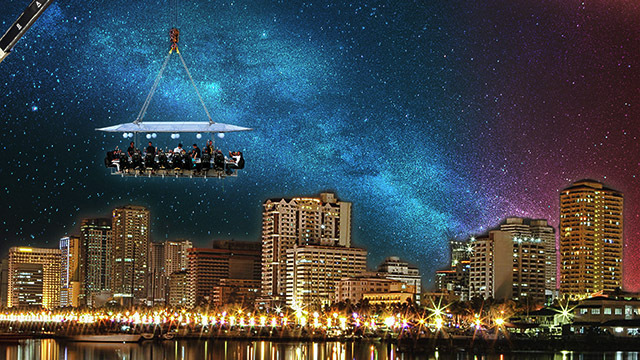 The “flying table” is located at the Solaire Resort and Casino grounds, so diners will be treated to spectacular sunset views of Manila Bay as well as the skylines of Entertainment City and Makati. DITS and MMI also partnered with Solaire to prepare the cuisine that diners will get to enjoy during the experience. During a press conference, officials of MMI and DITS Asia said Manila is the 47th city in the world to get DITS. In Southeast Asia, DITS previously took adventurous diners up in Kuala Lumpur, Malaysia and Bangkok, Thailand. Diners interested in DITS will have to make a booking through the website. The dinner is priced at Php9,990 and includes one of 22 seats on the DITS Philippines table and a four-course meal. The experience lasts for one hour. As for safety concerns, Randahwa says that DITS observes international safety measures certified by German experts. Out of 5,000 “flights” in dozens of cities around the world, he says no untoward incident has yet been recorded. DITS will be in Manila only for two months, or until the end of May, although officials said they are already considering possibly bringing it to other cities in the country. It will welcome its first “passengers” on Wednesday, April 4.
Who Wants To Be a Shirt Millionaire?